Setup prompts you to supply a host name for this computer, either as a fully-qualified domain name (FQDN) in the format hostname.domainname or as a short host name in the format hostname. Many networks have a Dynamic Host Configuration Protocol (DHCP) service that automatically supplies connected systems with a domain name. To allow the DHCP service to assign the domain name to this machine, specify the short host name only. You may give your system any name provided that the full hostname is unique. The hostname may include letters, numbers and hyphens. If your Red Hat Enterprise Linux system is connected directly to the Internet, you must pay attention to additional considerations to avoid service interruptions or risk action by your upstream service provider. A full discussion of these issues is beyond the scope of this document. The installation program does not configure modems. Configure these devices after installation with the Network utility. The settings for your modem are specific to your particular Internet Service Provider (ISP). When a Red Hat Enterprise Linux 6.9 installation boots for the first time, it activates any network interfaces that you configured during the installation process. However, the installer does not prompt you to configure network interfaces on some common installation paths, for example, when you install Red Hat Enterprise Linux from a DVD to a local hard drive. When you install Red Hat Enterprise Linux from a local installation source to a local storage device, be sure to configure at least one network interface manually if you require network access when the system boots for the first time. You will need to select the Connect automatically option manually when editing the connection. To change your network configuration after you have completed the installation, use the Network Administration Tool. Type the system-config-network command in a shell prompt to launch the Network Administration Tool. If you are not root, it prompts you for the root password to continue. The Network Administration Tool is now deprecated and will be replaced by NetworkManager during the lifetime of Red Hat Enterprise Linux 6. To configure a network connection manually, click the button Configure Network. 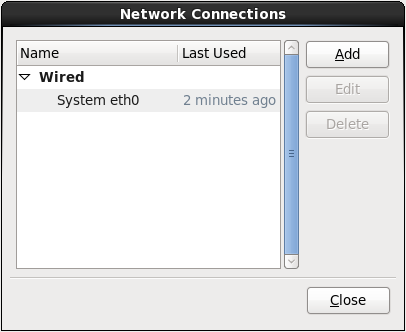 The Network Connections dialog appears that allows you to configure wired, wireless, mobile broadband, InfiniBand, VPN, DSL, VLAN, and bonded connections for the system using the NetworkManager tool. A full description of all configurations possible with NetworkManager is beyond the scope of this guide. This section only details the most typical scenario of how to configure wired connections during installation. Configuration of other types of network is broadly similar, although the specific parameters that you must configure are necessarily different. To add a new connection, click Add and select a connection type from the menu. To modify an existing connection, select it in the list and click Edit. In either case, a dialog box appears with a set of tabs that is appropriate to the particular connection type, as described below. To remove a connection, select it in the list and click Delete. When you have finished editing network settings, click Apply to save the new configuration. If you reconfigured a device that was already active during installation, you must restart the device to use the new configuration — refer to Section 9.7.1.6, “Restart a network device”. Certain configuration options are common to all connection types. Specify a name for the connection in the Connection name name field. Select Connect automatically to start the connection automatically when the system boots. When NetworkManager runs on an installed system, the Available to all users option controls whether a network configuration is available system-wide or not. 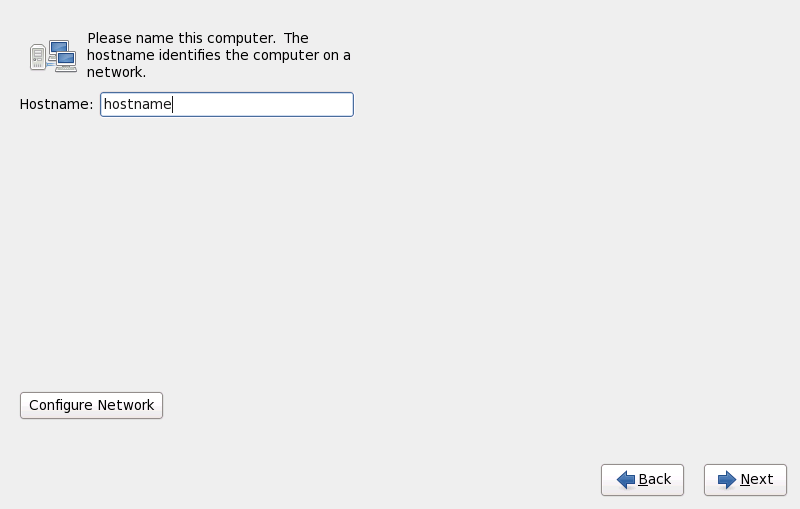 During installation, ensure that Available to all users remains selected for any network interface that you configure. Use the Wired tab to specify or change the media access control (MAC) address for the network adapter, and either set the maximum transmission unit (MTU, in bytes) that can pass through the interface. Provide the identity of this server. Browse to a personal X.509 certificate file encoded with Distinguished Encoding Rules (DER) or Privacy Enhanced Mail (PEM). Browse to a X.509 certificate authority certificate file encoded with Distinguished Encoding Rules (DER) or Privacy Enhanced Mail (PEM). Browse to a private key file encoded with Distinguished Encoding Rules (DER), Privacy Enhanced Mail (PEM), or the Personal Information Exchange Syntax Standard (PKCS#12). The password for the private key specified in the Private key field. Select Show password to make the password visible as you type it. 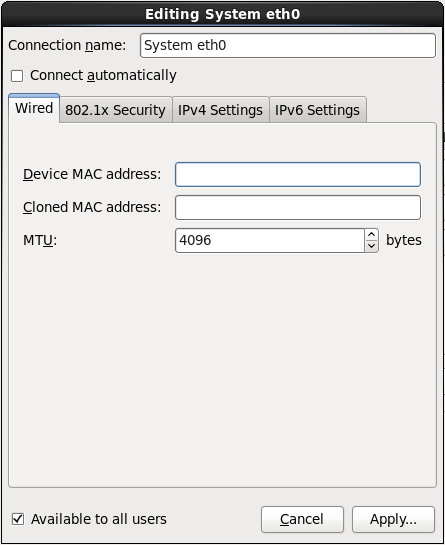 Use the IPv4 Settings tab tab to configure the IPv4 parameters for the previously selected network connection. IPv4 parameters are configured by the DHCP service on the network. 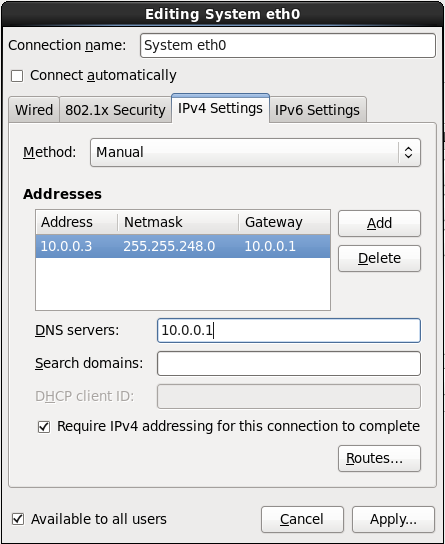 The IPv4 address, netmask, and gateway address are configured by the DHCP service on the network, but DNS servers and search domains must be configured manually. IPv4 parameters are configured manually for a static configuration. A link-local address in the 169.254/16 range is assigned to the interface. The system is configured to provide network access to other computers. The interface is assigned an address in the 10.42.x.1/24 range, a DHCP server and DNS server are started, and the interface is connected to the default network connection on the system with network address translation (NAT). IPv4 is disabled for this connection. If you selected a method that requires you to supply manual parameters, enter details of the IP address for this interface, the netmask, and the gateway in the Addresses field. Use the Add and Delete buttons to add or remove addresses. Enter a comma-separated list of DNS servers in the DNS servers field, and a comma-separated list of domains in the Search domains field for any domains that you want to include in name server lookups. Optionally, enter a name for this network connection in the DHCP client ID field. This name must be unique on the subnet. When you assign a meaningful DHCP client ID to a connection, it is easy to identify this connection when troubleshooting network problems. Deselect the Require IPv4 addressing for this connection to complete check box to allow the system to make this connection on an IPv6-enabled network if IPv4 configuration fails but IPv6 configuration succeeds. Red Hat Enterprise Linux configures a number of routes automatically based on the IP addresses of a device. To edit additional routes, click the Routes button. 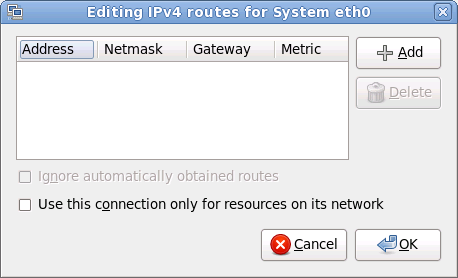 The Editing IPv4 routes dialog appears. Click Add to add the IP address, netmask, gateway address, and metric for a new static route. Select Ignore automatically obtained routes to make the interface use only the routes specified for it here. Select Use this connection only for resources on its network to restrict connections only to the local network. 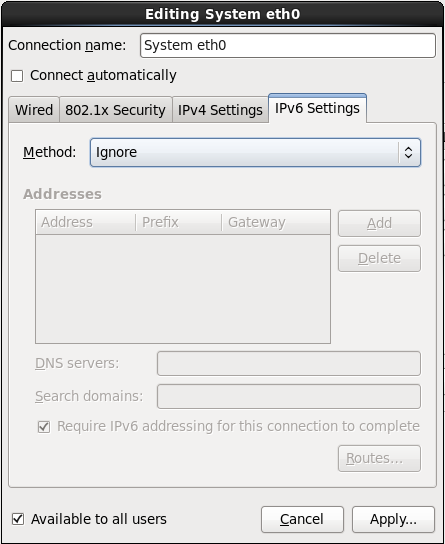 Use the IPv6 Settings tab tab to configure the IPv6 parameters for the previously selected network connection. IPv6 is ignored for this connection. NetworkManager uses router advertisement (RA) to create an automatic, stateless configuration. NetworkManager uses RA to create an automatic, stateless configuration, but DNS servers and search domains are ignored and must be configured manually. NetworkManager does not use RA, but requests information from DHCPv6 directly to create a stateful configuration. IPv6 parameters are configured manually for a static configuration. A link-local address with the fe80::/10 prefix is assigned to the interface. 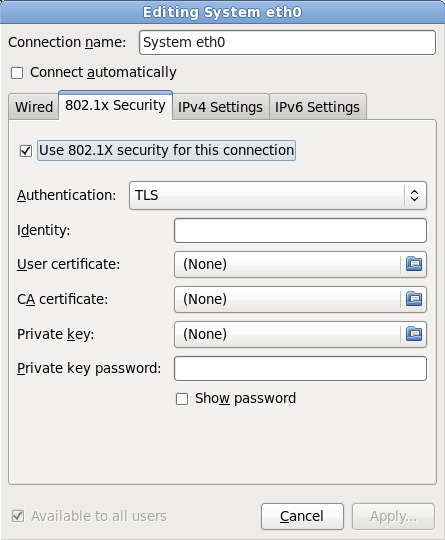 Deselect the Require IPv6 addressing for this connection to complete check box to allow the system to make this connection on an IPv4-enabled network if IPv6 configuration fails but IPv4 configuration succeeds. Red Hat Enterprise Linux configures a number of routes automatically based on the IP addresses of a device. To edit additional routes, click the Routes button. 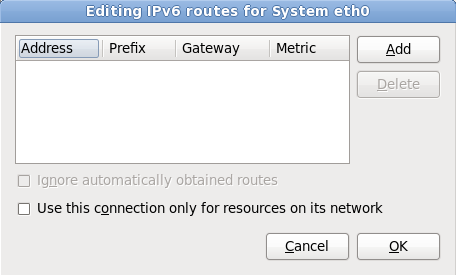 The Editing IPv6 routes dialog appears. If you reconfigured a network that was already in use during installation, you must disconnect and reconnect the device in anaconda for the changes to take effect. Anaconda uses interface configuration (ifcfg) files to communicate with NetworkManager. A device becomes disconnected when its ifcfg file is removed, and becomes reconnected when its ifcfg file is restored, as long as ONBOOT=yes is set. Refer to the Red Hat Enterprise Linux 6.9 Deployment Guide available from https://access.redhat.com/documentation/en-US/Red_Hat_Enterprise_Linux/6/html/Deployment_Guide/index.html for more information about interface configuration files. Press Ctrl+Alt+F2 to switch to virtual terminal tty2. where device_name is the device that you just reconfigured. For example, ifcfg-eth0 is the ifcfg file for eth0. The device is now disconnected in anaconda. Verify that the interface configuration file contains the line ONBOOT=yes. If the file does not already contain the line, add it now and save the file. The device is now reconnected in anaconda. Press Ctrl+Alt+F6 to return to anaconda.